Popular history magazines from the period provide the most impressive source for this kind of material though. Some editors simply reprinted 19th century European orientalist art, but more often they got artists and illustrators like the incomparable Munif Fehim to illustrate their stories. 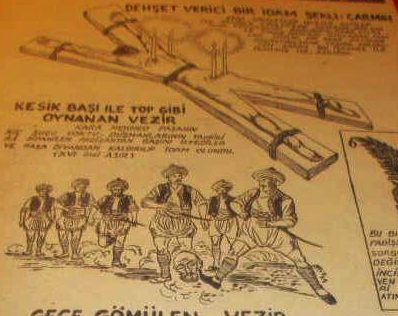 The picture below is from Feridun Fazil Tulbentci's novel about the pirate Barbarosa, serialized in the arch-Kemalist newspaper Ulus in 1948. 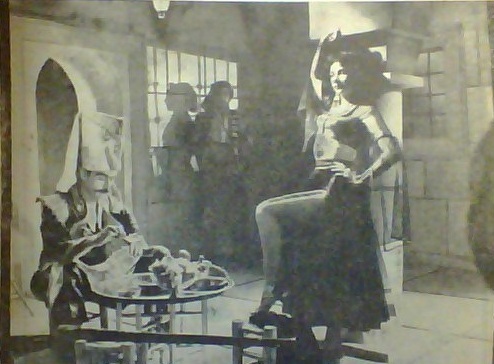 In keeping with the politics of the era, it shows wine drinking Turkish mariners protecting Arab women from sinister Christian knights while also chastely winning their hearts (the novel never gets more explicit than descriptions of people "flaring their nostrils with lust"). The caption reads: "Is there no good Muslim left to save me from the hand of these infidels." 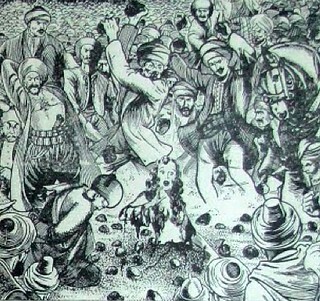 Sexualized Ottoman history was a staple of popular magazines like Ahmet Banoglu's History World, the first issue of which included a retelling of the Ottoman Empire's most famous stoning complete with the picture below (read the accompanying article here). 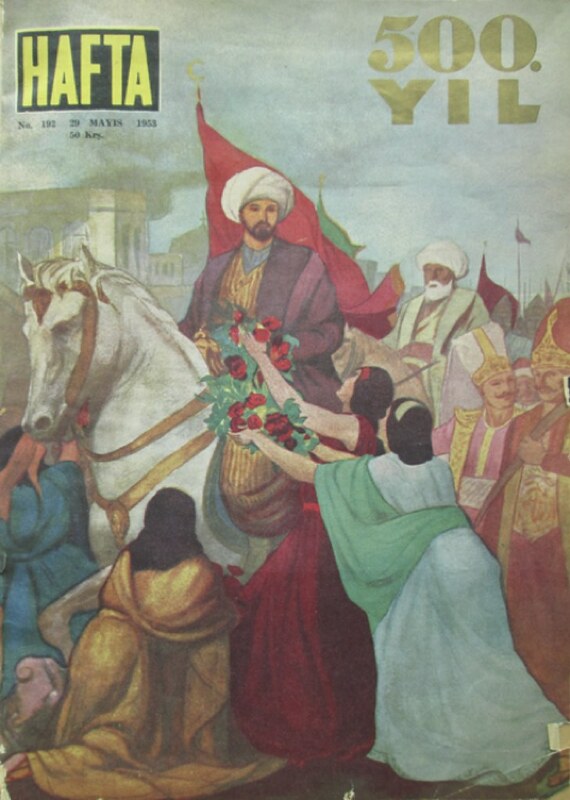 On the right is an image of the cover of a magazine celebrating the 500th anniversary of the conquest of Istanbul with Byzantine women showing their love for Fatih. 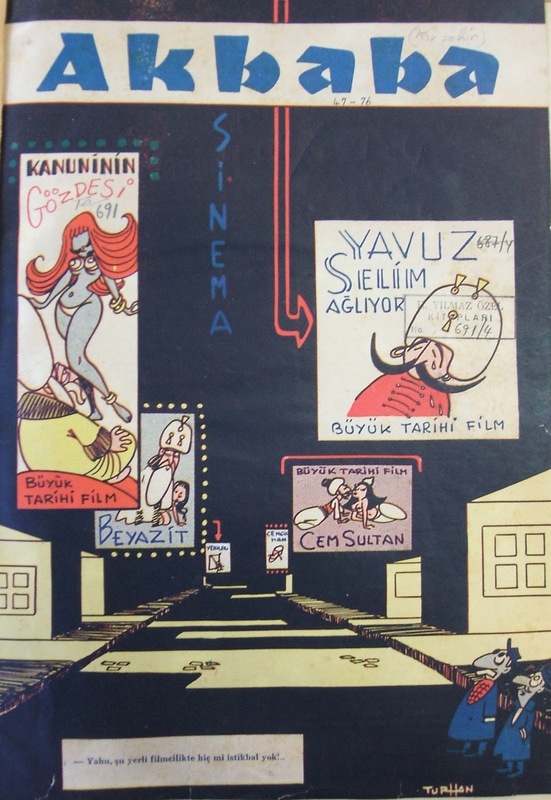 A less subtle rendition of the same theme comes from Munif Fehim in the 1939 classic "Don't Touch the Lion," in which he patriotically warns Italian fascists not to mess with Turkey while reminding them that the Ottomans once "planted and sowed Turkish seed in the blood of a thousand Venetian girls." 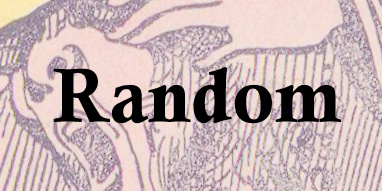 "Ask around," he continues "what Janissary lion rests in your great grandmother's heart?" Finally, it would be impossible to ignore the work of Reşat Ekrem Koçu, one of the most erudite authors of popular Ottoman history who combined serious scholarship with a Ripley's Believe it or Not style. 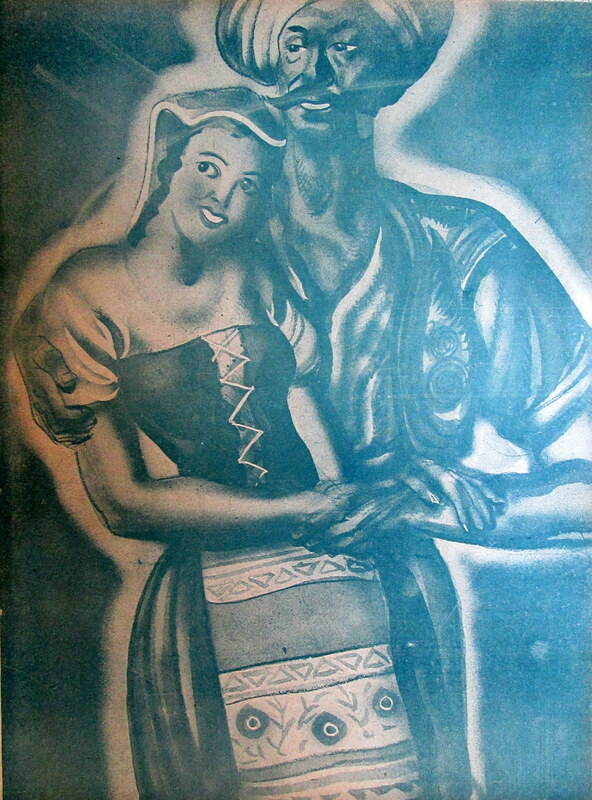 Works like his 1953 "From Osman Gazi to Ataturk" will be familiar to readers of Orhan Pamuk's "Istanbul," who were undoubtedly delighted to learn about the precise sexual feelings that the image below inspired in young Orhan. Koçu delighted in including strange and macabre details from the city's Ottoman history, detailing strange executions, love affairs, carnival amusements or monkey-murderers. It was an approach that proved perfectly compatible with nationalist glorification of military heroes from the Ottoman and Republican eras alike. ** Some people might rightly ask if it isn't a little ridiculous to write an article about neo-Ottomanism claiming people should stop talking about neo-Ottomanism all the time at a moment when so many more important things are happening in Turkey. I would only point out that I wrote this about a month ago in response to the New Yorker's piece on Muhteşem Yüzyıl. The publication was delayed on account of Crimea.